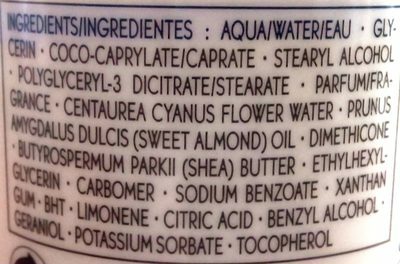 AQUA/WATER/EAU, GLYCERIN, COCO-CAPRYLATE/CAPRATE, STEARYL ALCOHOL, POLYGLYCERYL-3 DICITRATE/STEARATE, PARFUM/FRAGRANCE, CENTAUREA CYANUS FLOWER WATER, PRUNUS AMYGDALUS DULCIS (SVEET ALMOND) OIL, DIMETHICONE, BUTYROSPERMUM PARKII (SHEA) BUTTER, ETHYLHEXYL-GLYCERIN, CARBOMER, SODIUM BENZOATE, XANTHAN GUM, BHT, LIMONENE, CITRIC ACID, BENZYL ALCOHOL, GERANIOL, POTASSIUM SORBATE, TOCOPHEROL. Product added on December 29, 2016 at 7:51:57 PM CET by kipaul666. Last edit of product page on February 22, 2017 at 5:55:01 PM CET by tacite. Product page also edited by tacite-mass-editor.